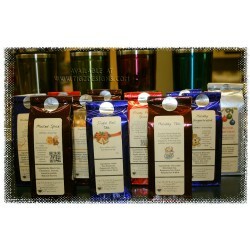 LOTS of variety in Christmas Tea - 50g size (mints weigh light, but the same size bags are filled to the brim). 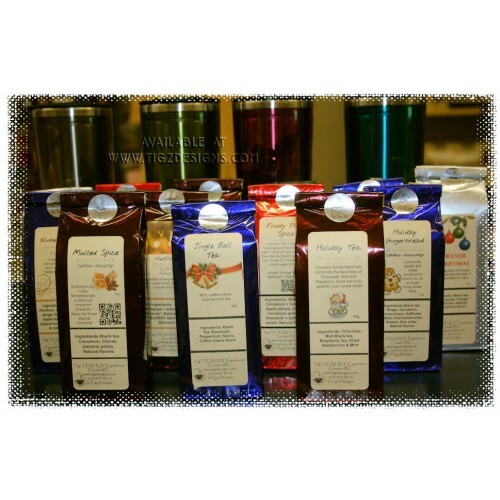 Listed are some of the Christmas Premium Loose Teas we bring in for the Holiday season. These make wonderful starts to Christmas Baskets and Stocking Stuffers - Plus, we are sure you will want some for you and your family too during chilly winter days. *Note: Please state choice on the comment section in the shopping cart, or you can call or email (tigzdesigns@telus.net) to make sure of stock. As we get closer to Christmas the varieties are less. 100g sizes are also available.